About that Shumlin approval poll | The Vermont Political Observer. Bit of a surprise came to us late last week, with news of a survey showing Governor Shumlin had suddenly enjoyed a surge in popularity. The results were released by Morning Consult, a national polling agency that gave Shumlin a 55 percent approval rating after collecting data online between January and May. Shumlin jumped nearly 10 points from the last time Morning Consult polled Vermonters, in November, when 46 percent of respondents gave him a thumbs up. The results are also at odds with a February poll from the Castleton Polling Institute that put the Governor at 37 percent approval, and the previous two Castleton surveys: in September 2015, Shumlin was at 40 percent; in March 2015, it was 41 percent. That’s awfully darn consistent. The Democratic Party was quick to promote the Morning Consult number. Understandable; it would be the best possible news for the party and its gubernatorial candidate. It would prove broad support for the Democratic agenda, and it would mean the candidate wouldn’t have to create distance between her- or himself and Shumlin. As for me, well, color me skeptical. After all, what has happened since February — or November — to bolster Shumlin’s popularity? He didn’t score any high-profile victories in the Legislature. And he’s taken quite a hit from the EB-5 imbroglio, since he’d associated himself so prominently with the scandal-plagued developers. Is there some other counterbalancing factor — some political “dark matter” exerting a positive gravitational pull on Shumlin’s numbers? Or is it just an outlier? Castleton pollster Rich Clark pointed to the small sample size. Morning Consult’s poll was a massive, state-by-state effort ranking all 50 governors — but in Vermont, it only surveyed 220 people. I’ll need to see another poll or two before I’m convinced that Shumlin has finally turned the corner. — The warm sunset glow surrounding a longtime executive who’s on his way out. Obama and Shumlin are no longer in the crossfire, as political attention turns toward the campaign for their successors. — The economy is kinda humming along. It’s far from perfect; there’s a lot of underemployment out there, and wage stagnation is a huge issue. But the recovery has been slow and steady since 2009. There haven’t been any big setbacks in quite a while. — Health care reform has had a chance to settle in. There are problems with the Affordable Care Act and (God knows) with Vermont Health Connect, but the uninsured rate has fallen substantially nationwide and in Vermont. The initial resistance has played itself out, and the benefits of reform have become clear. Those explanations aren’t entirely convincing to me. Again, I’ll need to see at least one more poll, maybe two, with high approval for Shumlin. Then, I’ll be convinced. And then, Phil Scott and the VTGOP will have a problem on its hands. Their entire campaign narrative is founded on widespread discontent with Democratic governance. If that discontent is coming mainly from the Republican base, then it’ll be an uphill battle to reclaim the Governorship or make any headway in reducing the Democrats’ lopsided majorities in the House and Senate. This entry was posted in Peter Shumlin, Vermont Democratic Party and tagged Barack Obama, Castleton Polling Institute, Morning Consult, Phil Scott, Rich Clark, The VPR Poll, Vermont Republican Party on May 24, 2016 by John S. Walters. I’ll give him a plus on governance but he lost me forever with his Hillary support. Peter Shumlin Decides to Run for Another Term ! 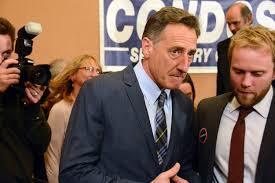 After a recent poll by Morning Consult revealed the Peter Shumlin is one of the “most popular governors in America” it is rumored that he will be filing petitions before the Friday deadline to appear on the August 9th Democratic Primary Ballot. This is great news for Vermonters eager for another two years of the unique style of leadership that only Peter Shumlin can deliver ! Read more about the Morning Consult poll at: http://vtdigger.org/…/for-democratic-candidates-is-shumlin…/? No more anchovy pizza at bedtime for you, Mr. Paige. You get nightmares. I quickly look around for my long passed father ! Maybe all the Lisman news makes him look that much better. It’s one poll for Shumlin. It’s a whole bunch for Obama, all showing his approval right at 50% or above. Sorry. Also, that “custom-tailored” “liberal” poll had eight Republican governors in the top ten nationally. If it was rigged, they did a really terrible job. I must agree-they did a really terrible job!